In June 2016, a FINRA panel in Albuquerque, NM ordered Centaurus Financial, Inc. to pay the Claimant, a recent widow when the subject conduct began, $150,000 plus all hearing fees after reasoned findings that “the investments Hashemian recommended while at Centaurus were not suitable”, that Centaurus was responsible for Hashemian’s actions which “constituted fraudulent and negligently made misrepresentation and omitted material information in the sale of investments” and that “Centaurus failed to supervise Hashemian is a proper and reasonable manner”. The award is available here . The unsuitable investments included non-traded REITs and annuities. I testified on liability and damages. Last year I testified in another case against Centaurus in which a FINRA panel awarded almost $1 million to the Claimant, another recent widow, over unsuitable sales of nontraded REITs and annuities. That award is available here. These cases are sad examples of easily preventable investor harm which continues because of the industry’s failure to put bad brokers like Hashemian (BrokerCheck CRD available here) and bad brokerage firms like Centaurus Financial (BrokerCheck CRD available here) out of business. When Centaurus hired Hashemian in October 2009 he had been terminated twice by prior employers after customer complaints, including by his then current employer First Allied Securities. Hashemian was also shortly thereafter censured and fined by FINRA for failing to provide material information to sellers of variable life settlements he recommended while at First Allied Securities. Despite being on “heightened supervision”, Centaurus allowed this broker to continue to victimize investors by selling nontraded REITs and annuities. And despite all this, Hashemian is still employed by Centaurus today. SLCG recently published a study of the BrokerCheck records of 1.2 million current and previously registered brokers. The study, “How Widespread and Predictable is Stockbroker Misconduct”, is available here. Using FINRA’s measure of investor harm and statistical tools for estimating the likelihood a broker will engage in future investor harm from the FINRA study, “Do Investors Have Valuable Information about Brokers?” available here, Hashemian was in the top one tenth of one percent of brokers at the end of 2009 after he was terminated by First Allied Securities and continued abusing investors with Centaurus’s assistance. That is, if you took 1,000 brokers at random, Hashemian would be the highest risk broker of the lot. This broker should have been forced out of the industry but instead, following the pattern identified by Egan, Matvos and Seru’s study “The Market for Financial Adviser Misconduct”, available here, he moved further down the quality later finding a firm even sleazier than First Allied Securities willing to hire him. A few weeks ago we posted Have 1.3% or 7.3% of Stock Brokers Engaged in Misconduct? listing the 10 highest risk brokerage firms amongst the 210 firms with more than 400 registered brokers. Centaurus was the 4th firm ranked by percentage of registered brokers associated with FINRA’s definition of investor harm. Hashemian was hired by Centaurus after being allowed to resign from First Allied Securities which, at number 12, is just off the list of worst 10 firms with 400 or more brokers. As of December 31, 2015, Centaurus employed 602 (0.11%) and First Allied Securities employed 1,179 (0.21%) of the 548,617 brokers employed by the 210 firms with 400 or more registered brokers. These two firms together employ only 0.32% of all brokers but employ 1.2% of brokers with investor harm events and 1.94% of brokers who had previously been fired after customer allegations. 16.28% of Centaurus’s brokers were associated with investor harm events meeting FINRA’s definition. This is more than 5.5 times the 2.93% average employed at the other 208 firms excluding Centaurus and First Allied Securities. Centaurus also employed more than 5 times as many brokers who had been terminated after customer allegations as the other 208 firms. First Allied Securities is only slightly better than Centaurus. Hashemian was first fired by NYLife Securities which has proportionately fewer brokers with investor harm events and far fewer brokers previously fired than the average of all firms. After being terminated by NYLife, Hashemian was hired by First Allied Securities which demonstrated a much greater tolerance for investor abuse, employing 4 times as many brokers with investor harm events and 10 times as many brokers previously fired after customer complaints than NYLife. Even First Allied Securities proved not to be lax enough and Hashemian next found himself at Centaurus which employs 5.5 times as many brokers with investor harm events and 15 times as many brokers previously fired after customer complaints than NYLife. Together the 12 high risk firms listed above employ only 3.9% of registered brokers but employ 14.1% of the brokers with investor harm and 13.2% of the brokers previously terminated after customer complaints. A broker and their coworkers’ prior customer complaints and whether they had previously been terminated after customer complaints are strong predictors of whether a broker will harm an investor in the future. 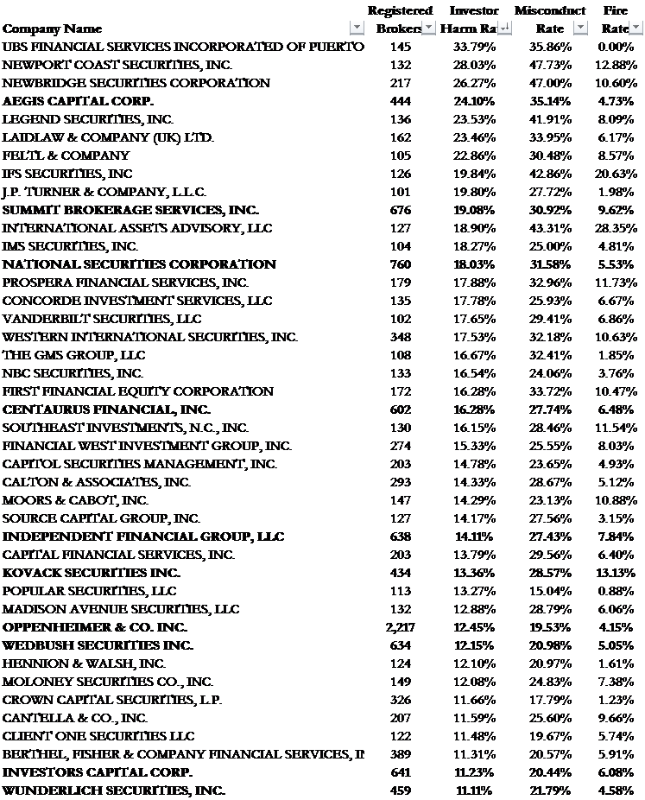 Any investor trying to protect themselves should start by avoiding the 12 firms listed above and similar smaller firms we identified in Smaller Firms Are Even Worse available here and listed in the following Table. 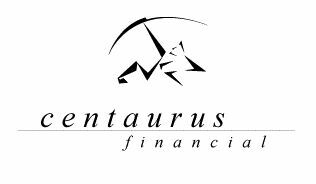 As Egan, Matvos and Seru found, firms like Centaurus and First Allied Securities appear to specialize in hiring bad brokers who had previously been terminated by better firms to continue to prey on unsophisticated investors like the victims in the two Centaurus awards I referenced above. There aren’t many firms worse than Centaurus. We’ll let you all know where Hashemian goes next.